Becoming parents is most cherish moment of life for any couple. If you are expecting a child, how about announcing it all your friends and family members on Facebook. There is no need to create custom message for pregnancy information, which might get lost of slew of updates on Facebook profile. 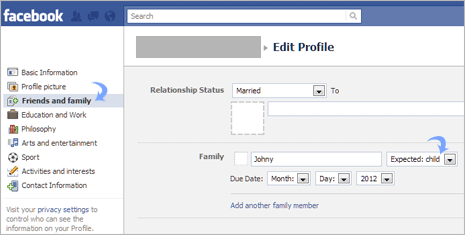 Instead, use ‘Expected: Child’ option to prominently display expected child information on your Facebook profile. 1. After Facebook login, click ‘Edit My Profile’ link next to your Facebook profile photo. This will open webpage to edit profile information and make changes. 2. Now click on ‘Friends and Family’ tab on the left side and look for ‘family’ section in the middle. Click ‘Add another family member’ option. 3. Then enter name of expectant child (you must have decided on some name, right?). Then select ‘Expected: child’ option from the drop down box. 4. Now you should see due date information boxes, select and enter due date of your expected child. Click Save Changes button and you are all set with automated status update announcing your pregnancy and expected child in near future. So, with few clicks (using above procedure) you can announce to everyone on Facebook “I am expected a child”. Besides the announcement, this will help your friends track birth of your child and send timely congratulations – what say? Well in that case ..we should also have relevent options like ..
Hey Facebook.. really want us to do a favour … bring in a ‘DISLIKE’ button ..high time!